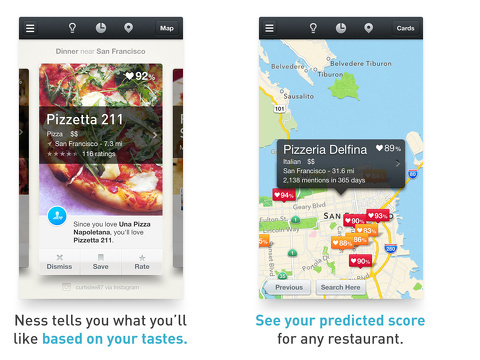 The Great Food Nearby: Ness iPhone app recommends restaurants based on your tastes and location. 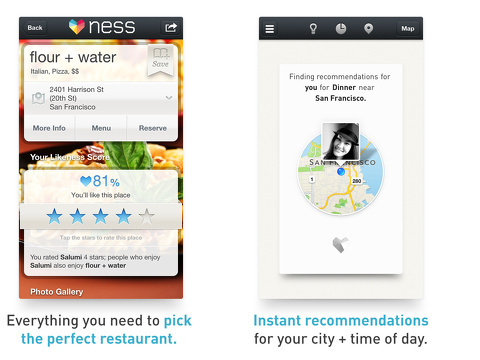 Instead of sifting through lists of nearby restaurants that may not interest you, the Great Food Nearby: Ness iPhone app helps tailor and customize restaurant choices with your likes, dislikes, and friends’ recommendations. Although it is packed with detailed information, the content is organized nicely. As a bonus, the integrated maps help you sit down to a great meal swiftly. The first stop should be to touch the list icon in the upper left corner. You can access your profile and get the chance to personalize your experience. You will want to connect your Facebook account. You can set your privacy filters to eliminate any posts on your behalf. The Facebook connection enables a cool set of information. You can find out where your friends check-in. You can authorize your Foursquare account information as well. From the list icon, you can also touch personalize to rate your check-ins from your existing social networks. You can also touch the settings icon on your profile page and select cuisines. Then, you can touch your favorite types of food. Finally, you can touch the food you hate to eliminate it from your feed. These steps lead the Great Food Nearby: Ness iPhone app to give you a percentage that you will like a restaurant. The Great Food Nearby: Ness iPhone app feed of restaurants has a strong visual element and neatly organized details. Each restaurant has a photo drawn from several sources like Instagram or high-quality general stock photos that represent a restaurant’s style of food. The stock photos can be slightly deceptive, as I have never seen a beautifully grill marked bruschetta at Subway. Details like type of cuisine, price range, distance, and ratings are concisely displayed in a band over the photo. The pieces of information that make the Great Food Nearby: Ness iPhone app unique are the probability of your interest in a restaurant, as well as the ability to dismiss, save, rate, and learn more. If a restaurant you hate pops up in your feed, you touch dismiss and it will no longer be included. One other extremely cool feature of the feed is the ability to change the time of day. If you are looking for dinner, then you tap the clock icon and adjust it. When you want to learn more about a restaurant, you touch the photo to move to a new screen. The visual strength remains, but the detailed information increases. If your friends have checked-in, then that information is shared at the top of the screen. You can check out a restaurant’s menu, find it on a map, rate it, and check out existing feedback. With one touch on the share icon at the top of the screen, you can email, text, copy, and share to Facebook and Twitter. The Great Food Nearby: Ness iPhone app contains cool customization features to filter out what you dislike, as well as suggest places you may really like. AppSafari review of Great Food Nearby: Ness was written by Jenni Ward on July 11th, 2013 and categorized under App Store, Food, Free, Social, Travel. Page viewed 4179 times, 2 so far today. Need help on using these apps? Please read the Help Page.